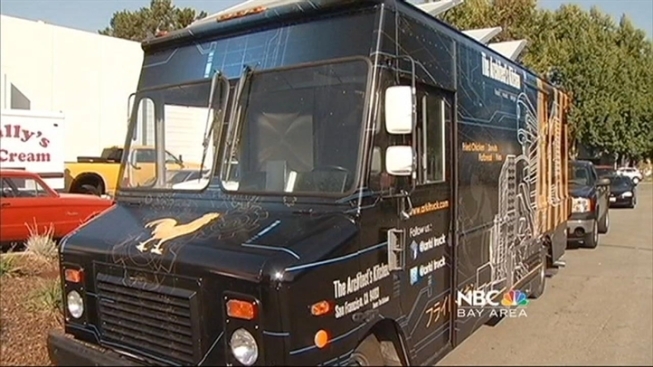 Bay Area man has been designing food trucks for three decades. Food truck fare is getting more exotic and high-brow, and the chefs turning out that food are not settling for a standard taco truck or hot dog stand. Luis Soto of Hayward-based U.S. Catering Trucks is helping chefs and foodies create the kind of kitchen they need in that tiny food truck space. Sarah Bauer-Mokaves said she and her husband are professional chefs who were looking for a way to make their dreams of a restaurant come true. Their Blast off Truck was customized from a linen truck. That’s just one of the unique requests that Soto has gotten. He installed a naan oven imported from India in one truck an put in a $10,000 pressure fryer in another. Audrey Kramer’s Sweet Treat Stop is more than a cupcake truck, it’s a full-fledged mobile bakery. For that, the Le Cordon Bleu-trained pastry chef wanted a precision kitchen. “I have these two phenomenal convection ovens and they work beautifully. I mean perfection,” Kramer said. But the cuisine is not the only thing that’s changing. So are the requests from clients who aren’t always trained chefs. Architect-turned-chef Tim Setiawan’s says customizing the outside of his creation ArkiTruck was as important as customizing the kitchen. His truck has a sound system. Others have plasma screens and elaborate lighting. “It’s kind of the feel I want, but it’s also, you’re coming here to eat good comfort food and get a good ambiance,” Setiawan said. That attention to detail is good for business. US Catering Trucks went from building about six trucks a year to building two or three a month. For that, Soto hired eight more workers. They’ve built trucks for customers around the Bay area, but also in Oregon, Washington, Arizona, and Las Vegas. While the trucks are a good alternative for people not ready or able to commit to a traditional restaurant, the trucks are quite an investment as well. A base-model truck costs about $60,000. Add in the bells and whistles and the tab can quickly run over $100,000. At the end of the day, the kitchen is just a kitchen and what really matters is the food. “My favorite feature of my truck is my food,” said Patrick “Cookie” Clark of TheGrillStars.com. Soto’s crew is building Clark’s second truck, which will be a little fancier than the first. More than one of Soto’s clients said he made their dreams come true. Soto said it works both ways, especially when he sees them at work, serving up the food they love.